The USS North Dakota (SSN 784) returned to its homeport at U.S. Naval Submarine Base, New London, Conn., July 20 after conducting groundbreaking operations in the Mediterranean Sea. Under the command of Capt. Douglas Gordon, the ship finished its first-ever mission by deploying and retrieving unmanned underwater vehicles (UUVs) from the ship's dry deck shelter (DDS) in an operational environment. 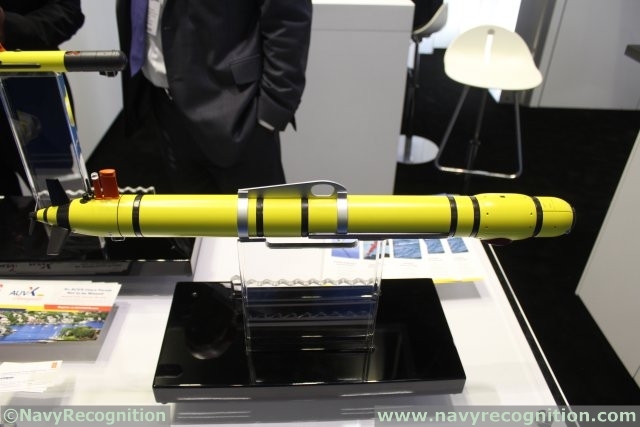 A Kongsberg Maritime REMUS 600 UUV was used in the tests. "The crew was very excited to be chosen to take the ship forward and conduct operations in support of fleet and combatant commanders' operational objectives," said Gordon. "It was a rare opportunity for the crew to be able to deploy prior to executing its post shakedown availability. Many crew members had never deployed before and were able to experience first-hand the hard work and effort required in preparing a ship for deployed operations. They trained hard and expertly executed our mission. I could not be more proud of their performance and the professionalism that they exhibited during our operations." Capt. Jim Waters, commander, Submarine Squadron 4 and the submarine's immediate superior in the chain of command, expanded on the captain's comment. "The timing within USS North Dakota's schedule, along with its highly-trained and certified crew, made it the optimal choice to conduct this mission," said Waters. "The mission completed by North Dakota also demonstrated the promising and emerging technology of UUVs within the Submarine Force." The REMUS 600 autonomous underwater vehicle was designed through funding from the Office of Naval Research to support the US Navy's growing need for operations requiring extended endurance, increased payload capacity, and greater operating depth. The REMUS 600 has been designed to operate to depths of 600 meters, allowing for greatly increased operational scope. The highly versatile system can also be configured for 1500 meter operations. North Dakota is the 11th Virginia-class attack submarine to join the fleet, and the first of eight Block III Virginia-class submarines to be built. The Block III submarines are built with new Virginia Payload Tubes designed to lower costs and increase missile-firing payload possibilities. The 10 current Virginia-class submarines have 12 individual 21-inch diameter vertical launch tubes able to fire Tomahawk Land Attack Missiles (TLAMS). The Block III submarines being built will have two-larger 87-inch diameter tubes able to house six TLAMS each. Virginia-class submarines are 7,800 tons and 377 feet in length, have a beam of 34 feet, and can operate at more than 25 knots submerged. They are built with a reactor plant that will not require refueling during the planned life of the ship reducing lifecycle costs while increasing underway time. Virginia-class submarines are built to dominate the world's littoral and deep waters while conducting Anti-Submarine; Anti-Surface Ship; Strike; Special Operation Forces; Intelligence, Surveillance, and Reconnaissance; Irregular Warfare; and Mine Warfare missions. Their inherent stealth, endurance, firepower, and sensor suite directly enable them to support five of the six Maritime Strategy Core Capabilities - Sea Control, Power Projection, Forward Presence, Maritime Security, and Deterrence.